The New York Times bestselling kitty boy blasts off into another hilarious adventure. Buckle up, amigos— everyone’s favorite kitty boy is about to lift off. You’ll want to be there when the brave Skippito gets lost in spice! That’s right, spice. Skippy knows— from his big ears to his toes—that the planet Mars is red because it’s covered in spicy red pepper. To prove it, he’s off on a space jaunt replete with craters, crazies, and creatures from Mars. His new adventure is packed with witty wordplay, Spanish phrases, and Judy Schachner’s trademark hilarity. This rollicking romp is simply out of this world. 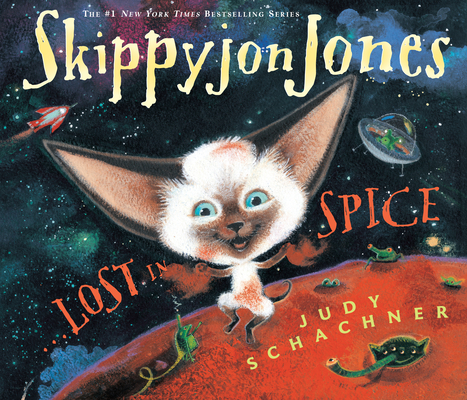 Best known for her Skippyjon Jones series, Judy Schachner has illustrated many of her own stories, including the much-loved Grannyman and its companion book, Bits & Pieces. She lives in Swarthmore, Pennsylvania.